Hello lovelies! Today I'm off to Cadbury World with my boyfriend for his birthday (yum! ), and of course I had to do some inspired nails to match. I wasn't entirely sure what to do, so started with a deep purple base and went from there. This is what I came up with. Read on for more info and to see how I did it! 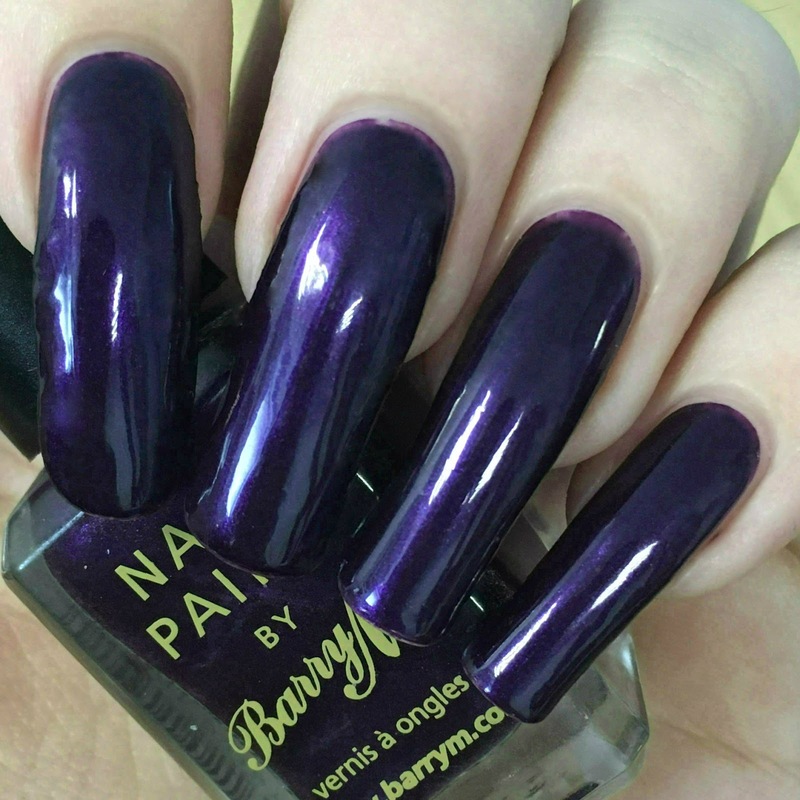 I started with a base of Barry M 'Vivid Purple'. I tried to find the best Cadbury purple in my collection, and I thought the shimmer in this would be a good match for the metallic packaging. It was very smooth and easy to apply, and has great opacity. Below is two coats and topcoat. 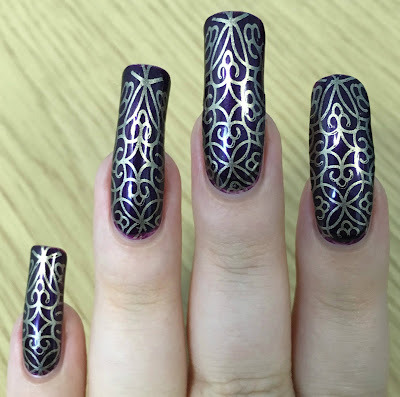 I decided to stamp over my purple base. I went for gold to match the Cadbury lettering. I wasn't too sure what pattern to use but knew I wanted something swirly. After a quick look through my plates, I settled on the top right design on Born Pretty BPL-027. I used my MoYou London XL sticky marshmallow stamper and Barry M 'Gold Foil'. 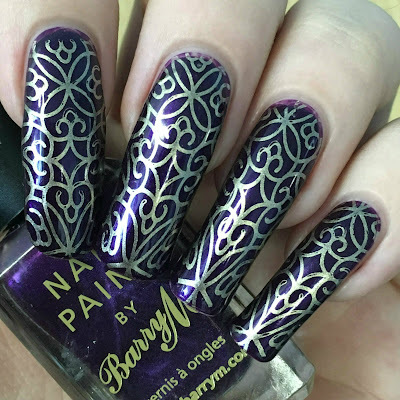 I've said this before but the Barry M foils are my favourite polishes to stamp with. 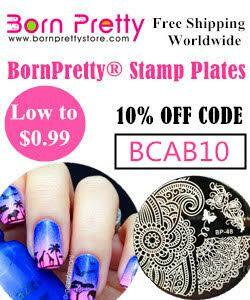 I find them easier to use than most designated stamping polishes. I stamped the pattern onto each nail, let everything dry for a few minutes, and then topcoated to seal it all in. What do you think? I'm not sure they really scream Cadbury, but I love them anyway! It's definitely the right colours (or close enough for me), so that'll do! I think the combination of the pattern and the colours looks fairly royal. When this post goes live I'll be stuffing my face with chocolate - I can't wait! Love the colours and I hope the chocolate stuffing went well, I'm totally jealous. Cadbury world was my childhood fave outing (I was a piggie). Wow i could see why you opted for purple and gold look! I know here our chocolates used to be wrapped in gold foil and then the wrapper was purple! Those nails are rocking! Love a good cadbury purple! Beautiful mani :) hope you enjoyed all the chocolate! Gorgeous mani! I'm jealous you got to go to Cadbury World! Wow Cadbury world and great mani ! These are beautiful and perfect for where you're going! I wish I could go there!